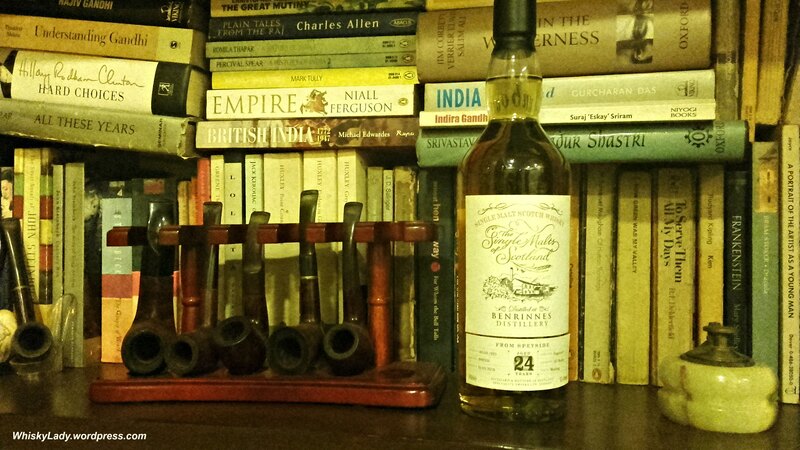 Out came the Benrinnes 24 year… You could be forgiven for not being familiar with this Speyside distillery. Benrinnes has the moniker ‘Diageo workhorse‘ as it primarily pumps out whisky for blends. Distilled 9 Sept 1991, bottled 10 March 2016, Hogshead Cask No 090508, Outrun of 287 bottles and part of the Single Malts of Scotland series put out by Specialty Drinks Ltd (aka TWE). Overall our initial impression was quite negative. What actually helped more was a revisit much later in the evening with a Gurkha Cellar Reserve Limitada 15 year cigar. In short – the combination worked. I decided to take a wee sample home to see what more may be going on away from the influence of our initial reaction. I’m glad I did. This 24-year-old Single Malts of Scotland bottling comes from one of Diageo’s workhorse distilleries, Benrinnes. Matured in a single hogshead, this is lively with notes of refreshing lemon oil, stewed fruits and savoury dark chocolate. Nose: Complex, intriguing nose that begins with toffee popcorn, vanilla sugar and honey-soaked sponge cake, then adds a layer of citrus aromas with orange and lemon, as well as a fresh floral note. Palate: Rather lively on the palate, with fresh and stewed-fruit notes, a touch of lemon oil that cleans and refreshes, ending with more savoury notes of tobacco, dark chocolate and espresso. Finish: Rich chocolate that coats the palate. Comment: Plenty going on with this whisky. You think it’s sweet, then fresh fruit arrives. You think it’s fruity, then darker, richer notes appear. I like it a lot, but I’m struggling to pin it down! Well… not a ‘hit’ like the Imperial… at least for our merry malters. However at least in the revisit a few more elements emerged. That said, it will never be a stunner in our books. This entry was posted in Scotland, Speyside and tagged Benrinnes, Benrinnes 24 year review, Single Malt Scotch Whisky by Carissa Hickling. Bookmark the permalink. I’m sure I remember a video by Ralfy where he didn’t like a whisky straight out of a new bottle but after pouring off a small amount and letting the remaining spirit breath for a few days it tasked significantly better. Sounds like the Benrinnes is one of those beasties. The distillery does do some nice malts but you have to think that some unlucky independent bottlers end up buying casks only fit for blending. Nice review! I’m looking forward to your thoughts on the Linkwood 25yo G&M. It was my uncle’s favourite and I treated myself to a bottle for my birthday a few years ago. Still haven’t opened it, nor a miniature I have from the 1980s, which could have been distilled in the late 1950s. One of these years I’ll have a taste-off between the two.